Return to the cobbled humble beginnings of a northern town and join a young lad achieve his dreams of getting a bit extra cash. He’ll probably give you a share of the profits, too. Uncover vintage cars and tabloid stands by matching combination reels that are sure to put a bit money in your back pocket. If you are looking for more adventure games, view these new slots online today! The NextGen Gaming team always strives for revolutionary and creative game design solutions and deliver innovative products to the market. They have been around for almost two decades and have provided extraordinary entertainment and quality video and fun ever since. With the big list of launched games, NextGen Gaming has become very popular, providing different themed titles and exciting slot games. We made it easier for you to find our UK slot games here. Known as one of the best slots in the market, you will be reminded of those old days when the nice neighbour’s boy would hand out the newspapers on the streets to win himself some extra cash. You are set in a year something between the 30's or 40's where no mobile phones existed to check the news on. You can see a street with buildings in the background and the newspapers boy on the left-hand side of the reel. The lower value symbols of this game are the common A, Q, K, J and 10. The higher value symbols fit the theme and include a big stack of newspapers, a little red cart, a kiosk, an adorable dog and a newspaper van. There are five reels and four rows filled with 50 different paylines to make yourself some extra cash. The wild symbol is represented by a newspaper headline and the extra wild feature can become very convenient. From time to time the paperboy may toss an extra wild on reel two, three or four. During the free spins he may add a wild to any reel and they will turn into sticky wilds, staying in their positions for all free spins. If you see a nice representation of the printing process on any position of the reels you will have discovered the scatter of the game. If you land two, three or four scatters you will trigger a re-spin. All the reels already containing a scatter will be held and the rest will re-spin trying to land you some extra scatters. If you have three or more scatters by the end of the re-spin you will be rewarded with free spins. Three scatters will award you with 8 spins, four scatters will give you 12 spins and five scatters grant you 20 free spins. This feature cannot be re-triggered during the period of the bonus spins. To try a spin on this exciting video slot you will have to bet as little as 1p or, if you consider yourself somewhat of a high roller, up to 100 pounds. And if you are already on it why not try the gamble feature after a win? To activate this feature you just have to click the “Hearts/Clubs” button below the reels and get the opportunity to double or quadruple your win if you guess the correct colour or suit of the next drawn card. You can use this feature for up to five wins in a row. 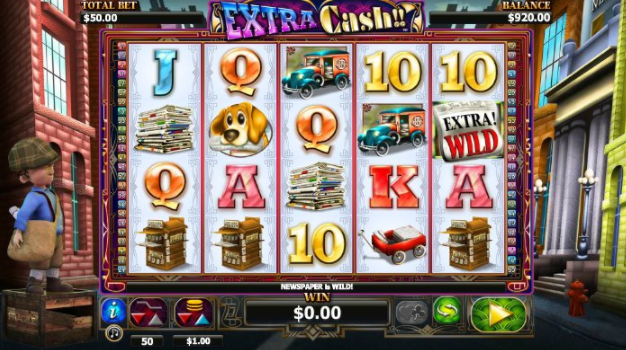 Extra Cash is an exciting video slot filled with thrilling features such as the extra wild feature or sticky wilds during free spins. The aesthetics are nicely done with 3D graphics and intriguing little animations that will immerse you into the setting and grant you an entertaining gameplay experience. 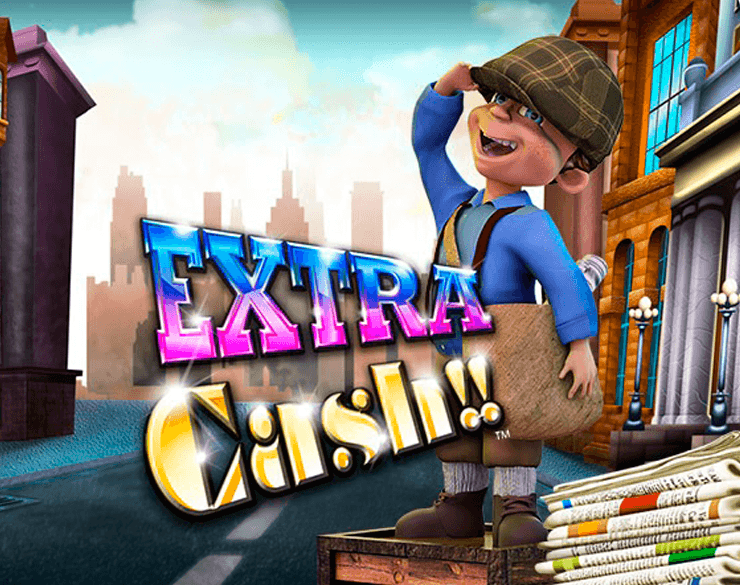 Extra Cash offers a nice game feel and can become very rewarding with the mix of its features.